People who like tacos are good people. I mean, how can you go wrong? Delicious, savory, crunchy, colorful fillings in a portable shell – it’s literally what dreams are made of. Well, that and Peanut Butter Cup Pie, am I right? 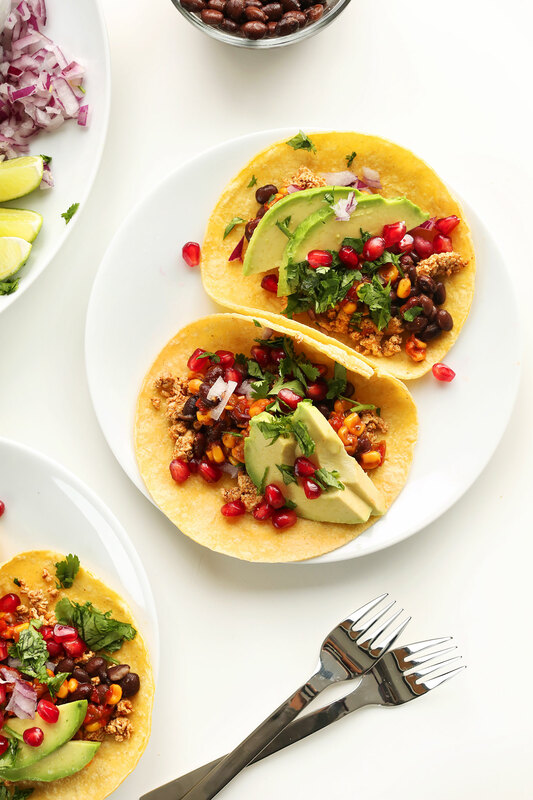 In my quest to switch up breakfast, these simple, colorful tacos came to mind. I’ve recently been into pomegranate arils on EVERYTHING, especially baked sweet potatoes with black beans, onion, cilantro and salsa. It’s literally my go-to lunch these days and I have no plans of changing that anytime soon. I highly recommend it right after you nosh on these tacos. This recipe comes together in about 30 minutes and is seriously versatile! Not a tofu fan? Sub roasted sweet potatoes or leave it out. No cilantro? Sub kale. Mash your black beans for more a “refried” feel. The breakfast possibilities are endless. 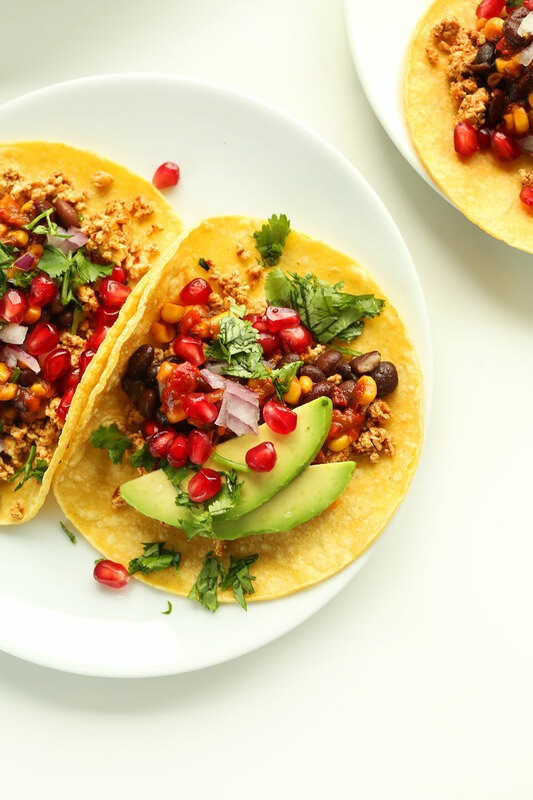 These tacos would make a colorful, filling and healthy breakfast or brunch for two, and are easy to multiply for a crowd. Bonus? The toppings keep for days in the fridge so you can make them ahead and nosh on them all week in various forms. I hope you give these a try! And if you do, be sure to tag a picture #minimalistbaker on Instagram so we can see. Cheers! 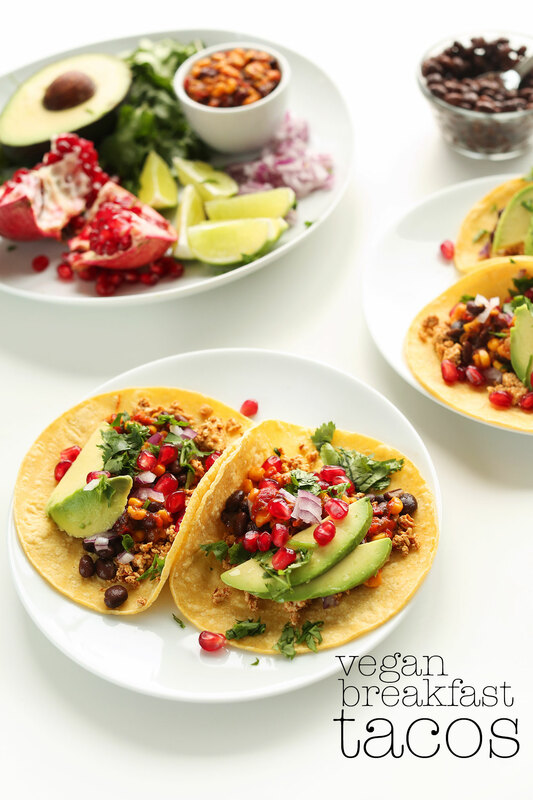 Simple 30-minute vegan breakfast tacos with a spicy tofu scramble and hearty black beans topped with veggies, creamy avocado, and pomegranate arils! Healthy, filling, and so delicious. Wrap tofu in a clean, absorbent towel and place something heavy on top, such as a cast-iron skillet, while prepping toppings. Cook black beans in a small saucepan over medium heat until bubbly. Then reduce heat to simmer and set aside. If unsalted/unseasoned, add a pinch of salt, cumin, chili powder, and garlic powder. Add dry tofu spices + salsa to a small bowl and add enough water to make a pourable sauce. Set aside. Heat a large skillet over medium heat and unwrap tofu. Use a fork to crumble. Once the pan is hot, add 1-2 Tbsp (amount as original recipe is written // adjust if altering batch size) oil of choice and the tofu. Stir fry for 4-5 minutes to brown. Then add seasoning and toss to coat. Continue cooking until browned and fragrant - about 5-10 minutes - stirring frequently. Set aside. To serve, warm tortillas in the microwave wrapped in a damp paper towel or in a 250-degree F (121 C) oven (optional). 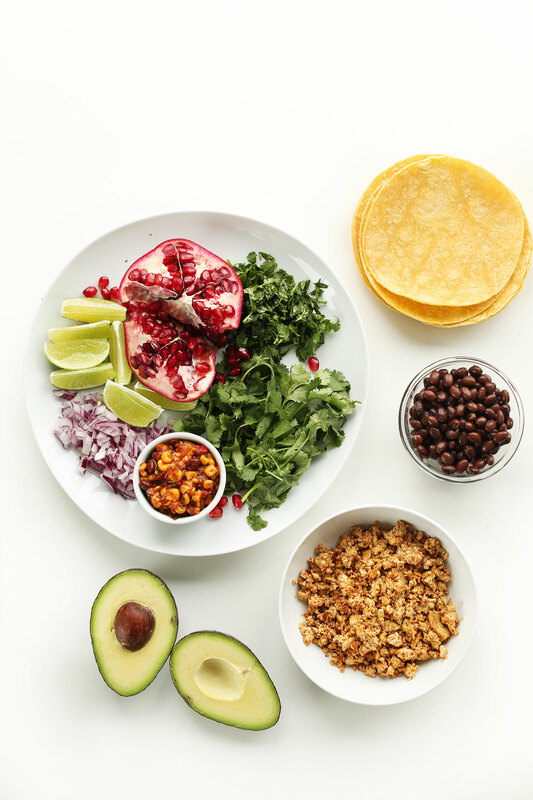 Top tortillas with tofu scramble, black beans, onion, avocado, cilantro, salsa, fresh lime juice, and pomegranate arils (or desired toppings). Serve immediately with the best breakfast potatoes or fruit. *Nutrition is a rough estimate. *Tofu adapted from my Spicy Southwest Tofu Scramble, originally inspired by Eat Within Your Means. This easy Mexican tofu was a last minute throw together taco bar item! I love when all the ingredients are on hand! It was delicious! We’re glad to hear that you enjoyed this recipe, Sharon! We were stuck in an avocado toast or oatmeal rut and this was an awesome and easy change for breakfast! Hubs said if he had to chose only one breakfast for the rest of his life that this would be it. Next time I’ll double the recipe so we can have more leftovers for through the week, and this will certainly be in our regular rotation. Next I’ll try the Buckwheat crepes you posted this morning! Thanks so much!! Solid taco recipe. The pomegranate arils take it to another level, but it is also great without them. I have made it both ways. I usually double the recipe so I can reheat it in the morning for two breakfasts (for 2 people). Also good as a breakfast burrito. Thanks, Dana! I love tacos and will definitely try out this simple yet healthy breakfast recipe tomorrow but without avocado. Amazing recipe – thank you for sharing! haha, already taken! Thanks for sharing, Rachelle! I had scrambled tofu for the first time yesterday, and it far exceeded my expectations. I have never made it at home, though. I cannot wait to try this recipe! I made these as soon as I saw the recipe! It’s such a simple, sort of formula for throwing together whatever you have on hand. I sauteed fresh garlic with onions, too, and added a Mexican spice mix I had. This was a fantastic dinner after an exhausting day. The pomegranate makes the whole meal so refreshing, and the tofu and beans made it filling! I used salsa verde, it gave a really nice flavour to it. Thanks! :) I’m thinking of substituting the salsa with almond butter sauce/peanut butter sauce tomorrow. I just made something super similar to this a few nights ago – black bean and tempeh tacos on homemade sourdough tortillas! SO yummy and I bet these are just as good! Also, is that corn in the tacos? I don’t see it listed on the recipe! How long will the tofu keep in the fridge once cooked? I really want to make these but I’m the only one in my house that eats tofu. Pomegranate arils on everything. Always. I had pomegranate salsa the other day – it was so good! In fact, it would be beyond delicious on these. Thanks Laura! Hope you love whatever version of these you make! As much as I love your granolas, this will be a nice change. Must see if I can find organic corn shells, since I try to avoid GMO stuff. Genius to put in some pomegranate arils—I have a freezer full of them since I have a friend who has pom trees in her backyard! I love the way these taco’s look, they look so tasty. I’ve been using a lot of cranberries lately, will maybe try pommegranate as well soon. 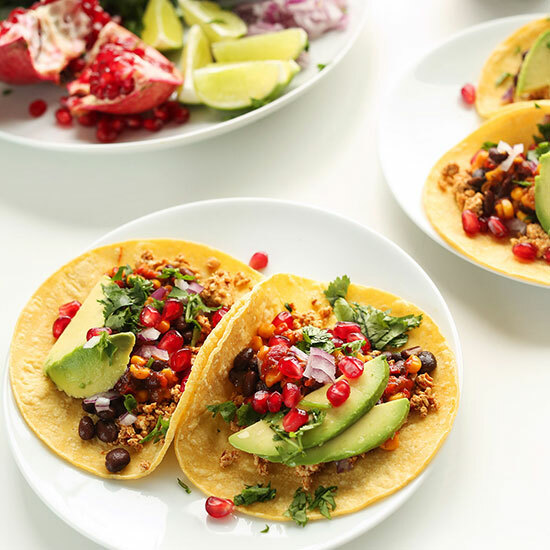 Pomegranate on tacos? Seriously? (But who am I to talk about that, since I never even tasted fresh pomegranate! Some day I will, when my pocketbook can afford it.) By the way, the tacos look mouthwatering! This is happening this weekend. Done. I love the idea to include pomegranate-I don’t see it in savory dishes much but sounds like it works! I’ve never though to put pomegranate on my tacos. I definitely have to give this a try. Ahh I want to eat these right now! Ingredients have been added to the grocery list. Also, love these photos & the bright quality to them!! Thanks Ashley! Hope you love these! What a great idea! I’d add some scrabbled eggs into the mix to make it more “breakfasty” and I just love eggs. The sweet potatoes sound amazing!! Looks wonderful!! love this! I love cilantro on everything! The pomegranate seems a bit out of left field but I will give it a try! Hope you’ll give it a try, Heather! I do love a good tofu scramble, so these breakfast tacos seem right up my alley. Love it! Man, oh man. These sound perfectly filling and so yummy! I’m usually a “sweets for breakfast” type of girl, but I’ll definitely have to give these a shot! Hope you love them, Alexa! Thanks for saying hi! Wait, why have I not been eating tacos for breakfast too!? A three-taco a day diet is my kind of diet! I love everything about this. Where do I begin? First, POMEGRANATE ARILS on TACOS. You are my hero. Why didn’t I think of that? I have three poms sitting on my counter right now, and can’t get enough of them. Brilliant, I tell you. Second, breakfast tacos are one of my favorite things on the planet. Always with avocado and Cholula. Third, you are the classiest lady around for the second mention. Big time high five and a hug comin’ at you. 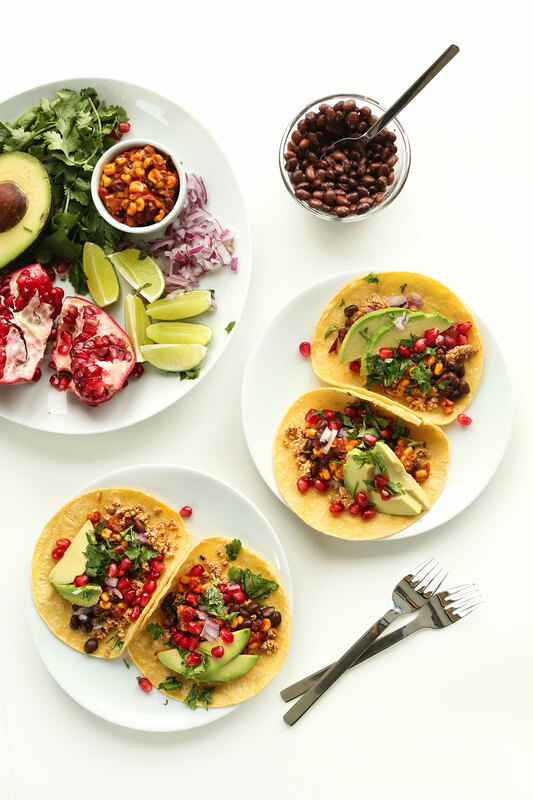 I’ve been crushing on pomegranate arils BIG TIME lately, but I would have never thought to add them to tacos. Sounds amazing. These are so simple and sound so delicious! Just printed out the recipe to try. Hope you love it, Ashlee! I love tacos, and these are so delicious! Stunning pictures! tacos and peanut butter ANYTHING is what dreams are made of. These are the sexiest breakfast tacos I’ve seen! So pretty! Mmm I feel like this would be the perfect weekend breakfast! I love the addition of pomegranate here. It’s something I never would have thought of but it would add such a great flavor! This is literally heaven! SO tasty!!!!! Ahhh! Can’t wait to try these – perfection! Super clever!! These look delicious!! It’s like homemade Soyrizo! Love this. Tacos are my love language! Soyrizo? I need to research this amazingness! I hope you found it because it’s amazing! I’m making these tacos with sweet potatoes now!